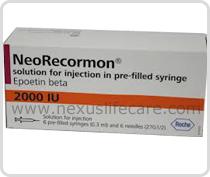 Uses:- Neorecormon Injection is used to treat anaemia (low red blood cell count) in people with long-term serious kidney disease (chronic renal failure). Side Effects:- Headache, body aches, diarrhea, and irritation at the injection site may occur. including: rash, itching/swelling (especially of the face/tongue/throat), severe dizziness, trouble breathing.